“Angel´s” share, or “The angel’s slug”, is a definition from the whiskey distillery and refers to the share of the whiskey that evaporates in the cask during the course of its storage. The size of the share depends on various factors, above all the ambient temperature, the humidity as well as the type, age and size of the cask. The relative humidity also determines whether more water or more alcohol evaporates. 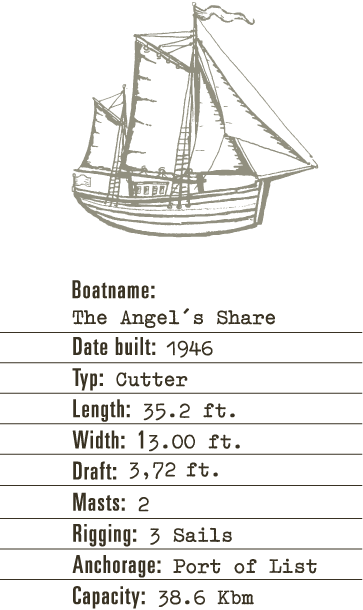 The “The Angel´s Share” is a former fishing boat with home ports in Büsum, Tönning, Meldorf and from 1959 to 1967 in List on Sylt. The over 60-year-old cutter was elaborately restored at the Landberg shipyard and subsequently transferred back to List. Now, our Single Malt Whiskey SILD “Crannog Edition” ages in selected casks in the cargo area of the ship.